I am so thankful for Pinterest. I mean seriously. I love it. I wanted to make a variety of sweets this weekend. 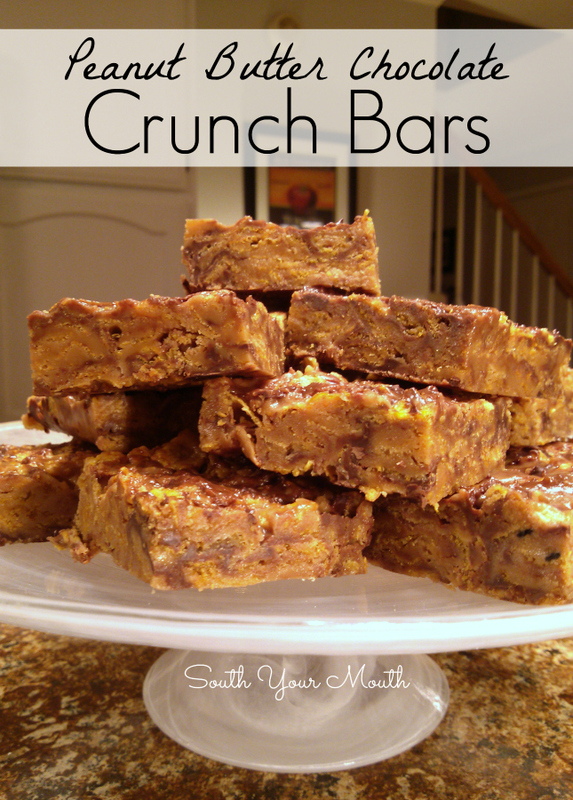 I had a few ideas in mind but I decided to pop over to my “Stuff I Want to Cook” board and found the No-Bake Peanut Butter and Chocolate Cornflake Bars I’d pinned from Joyously Domestic. Like eons ago. But because of the magic that is Pinterest, I rediscovered these beauties and got excited all over again. I had this post all typed up and scheduled to roll out today but something happened at home last night that made me change up my post. Something amazing happened. Husband got excited about these. Why? I don’t know how or why the universe decided my soul mate would be someone as completely disinterested in food as Husband is but he couldn't care less about it. I used to get my feelings hurt so bad I’d want to cry. And then it would just make me so mad I’d want to spit! He’d rather eat Subway or a bag of Doritos than anything anyone ever made homemade. He just doesn't care about food. And he especially lacks appreciation for Southern cuisine. I do not understand this. This does not compute. And he really doesn't care much for sweets. So when he came around the corner last night with one of these in his hand to declare to me that they were “really frickn’ good” I was shocked. They've been sitting on the counter for three days. It took him three days to even spark enough interest to try one. And look at the things! Would it take you three days before you even thought to have a taste?! And then he got another one later. And proceeded to tell me again how good they were. Folks, in ten years, this was the most enthusiastic reaction I have ever gotten out of the man (regarding food, that is! ~snort~). The kicker? It’s not even my recipe! Ha!! So, thank you, Joyously Domestic, for finally making Husband’s taste buds sing! Measure out corn flakes and add to a large bowl; set aside. You have to do this beforehand because you need to work quickly once the corn syrup mixture is ready. Line a 13x9 baking dish with wax paper or aluminum foil; set aside. Same drill. Heat corn syrup, sugar and salt in a medium-sized saucepan over medium heat until boiling. Boil mixture for one minute or until sugar is no longer gritty. Do not cook longer than one minute or your soft syrup could set up like taffy or hard candy! Remove from heat then stir in peanut butter and vanilla until smooth. Pour peanut butter mixture over cornflakes and gently fold until about halfway combined. Add chocolate chips and continue gently combining mixture until cornflakes and chocolate chips are evenly distributed (chocolate chips will melt slightly). Spread mixture into prepared pan and tamp down a bit (I laid a sheet of wax paper over it and pressed down with my hands but a rubber spatula would do the trick too). Once cooled to room temperature, cover pan and refrigerate until chocolate is firm. Lifting up on wax paper or aluminum foil, remove giant awesome slab of goodness from pan then cut into bars. Store in an airtight container at room temperature. Could I substitute the corn syrup with anything else? I don't like to use it. These look quite yummy. I have a grandson who LOVES Butterfingers.....any suggestions as to how I could add some to this recipe? Thanks in advance for your help. I love your blog and your humor. I would substitute chopped butterfingers for the chocolate chips. Wow that was quick.....thank you so much. I'm going to give it a try.